Climate-related technology can be an option to keep global temperature increase below the 2° C target set by the Paris Agreement. This master thesis tests whether strategic interaction (interaction between n>2 players, who inter alia maximise their respective utilities, and where the players’ payoff depends on the actions of the other players) hinders or fosters countries (players) to invest in four climate-related technologies, (i.e., abatement AB, energy efficiency EE, adaptation AD and low-carbon technology LC) in a non-cooperative setting. It is shown that strategic interaction hinders the incentives to invest in abatement technology, fosters the incentives to invest in energy efficiency and adaptation technology, and can both foster and hinder the incentives to invest in low-carbon technology. This is true for all countries. We conclude that this could partly explain the low level of current mitigation measures worldwide. Tropical cyclones are known for their severe direct impacts. Some of them undergo extratropical transition when they recurve (from north-westerly to easterly directions) over the Atlantic and move poleward into a midlatitude environment. They have a potential for high impact weather further downstream, over Europe. During extratropical transition, the ascending air and enhanced moisture transport causes strong latent heat release and inject air with low potential voriticity into the upper troposphere (upper panel of the Figure). This in turn accelerates the upper level jet and amplifies its waviness. This meridional amplification of the extratropical flow over the Atlantic is important for the formation of extreme precipitation events over Europe (lower panel of the Figure). This thesis provides the first climatological assessment of the effect of recurving North Atlantic tropical cyclones on precipitation extremes over Europe. We find a significant increase in precipitation extremes over Europe in three out of four major configurations of the atmospheric flow, and between 30 and 72 hours after the interaction onset. The response is however sensitive to the jet configuration at the moment of the interaction. 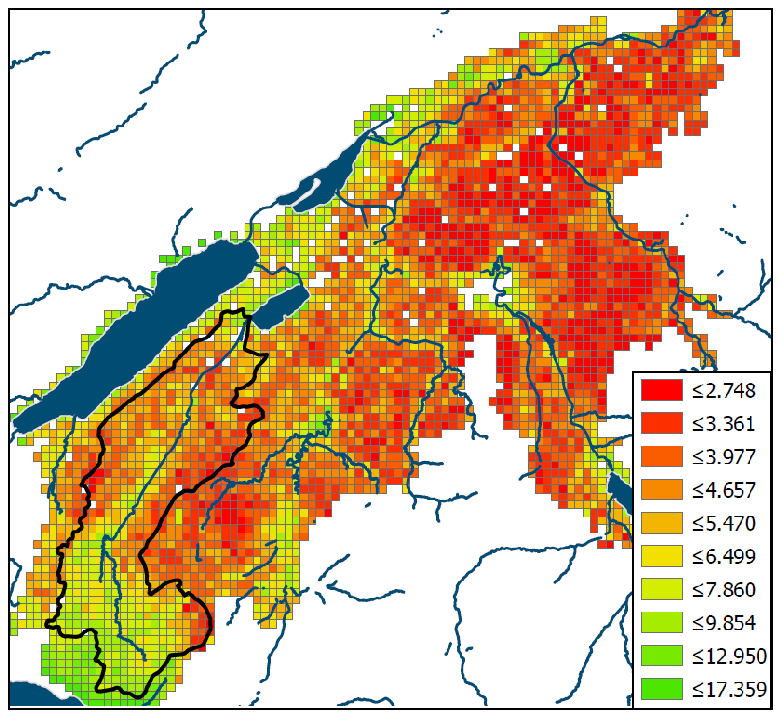 Difference between current and future species richness (shade indicates number of species) in western Switzerland for a moderate scenario, i.e. a combination of +2° C mean winter temperature and -20% intensive pasture. Agricultural intensification and climate change are among the main drivers for biodiversity changes. In this thesis, a two-part hurdle model was implemented to predict present and future plant richness in grasslands of the western Swiss Plateau. An extensification of grasslands (>=20% of pastures area from intensive to extensive) under warmer conditions (+ 2° C in mean winter temperature) is found to produce higher species richness (i.e. up to 70 % more species) in the study area until 2050. Dendroclimatology utilizes a number of tree-ring parameters to reconstruct past climates. This thesis investigates the mechanisms that drive variations in wood density of eight Pinus cembra cores, using an image analysis software with very high resolution. A biplot of the first two principal components (PC) shows the relationships between relevant anatomical features of tree rings (shown are abbreviations in the Figure). 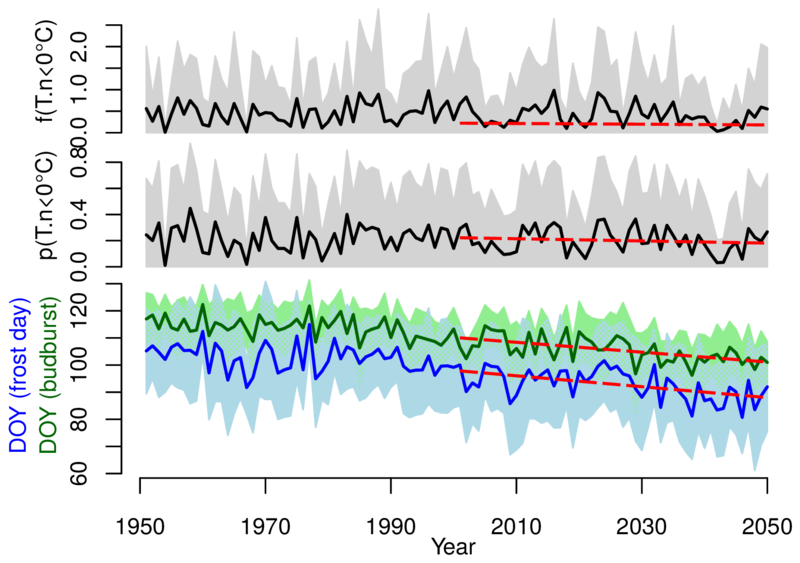 The first PC (x-axis; explaining 47% of the variance in the original dataset) can be seen as a measure of the cell wall thickening phase. The second PC (y-axis; 19% explained) is a good measure of mean and maximum density. The vector length is equal to the variance of the variables. Furthermore, the distance between vectors refers to the similarity between variables. 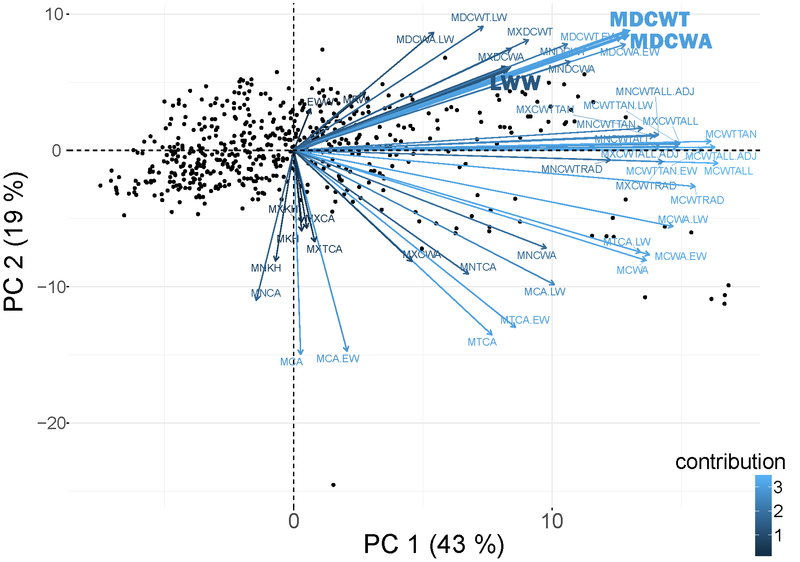 In short, latewood width (LWW; highlighted) is strongly correlated to density parameters (MDCWT & MDCWA), i.e., closely resembles mean density. Solar photovoltaic technology has been available since the 1950’s however the technology has not been widely applied until the beginning of this decade. In this thesis, the paramount factors for this boom are investigated using Qualitative Comparative Analysis of the leading promoting countries, i.e. with at least 10 gigawatts of installed solar photovoltaic capacity. The analysis revealed three potential pathways. The first positive pathway (Path 1 in the Figure; dot sizes represent importance) includes the cases of Japan and the United States. They are representative of cases that have "Ability" and* "Resource Intensive Populations" and* "Potential to decarbonize their electricity and heat production sectors". The second pathway (Path 2), represented by China and Japan, is similar to the first in the sense that they have the same parsimonious solution (taking only the large circles into consideration). The third and final pathway (Path 3) is indicative of a more sustainable path taken by European countries such as, Germany and Italy. 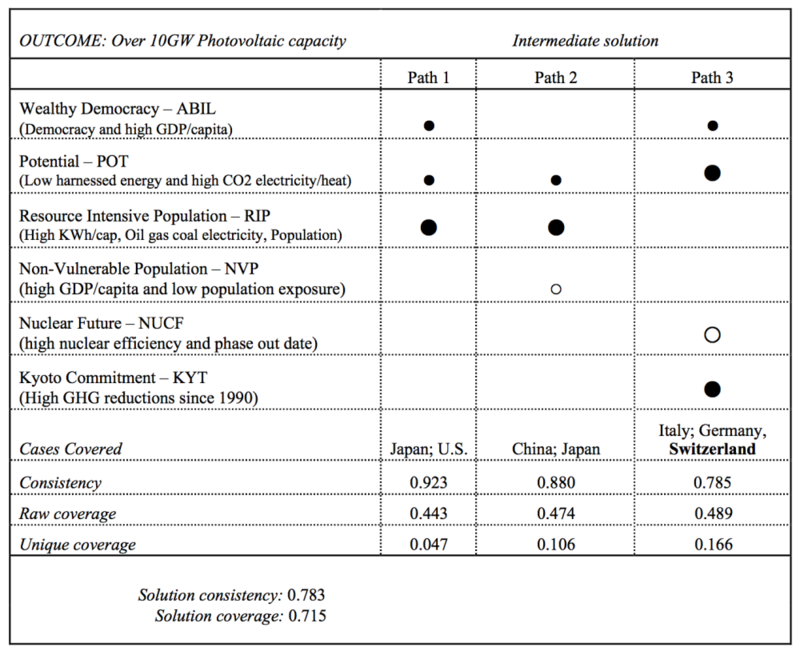 This more sustainable pathway is highlighted by the presence of "Kyoto Commitments" and* the "Inability to rely on nuclear power production in the future" and* "Potential to decarbonize" and* "Ability". Global warming does not only cause the growing phases of plants to start earlier, it also leads to a shift in the average day of year of latest frost days. Depending on the magnitude of these changes, as well as on the corresponding variances, it is not clear if risk for spring frost damage will increase or decrease. Focusing on the Swiss Rhone Valley, future risk according to the SRES A1B scenario was modelled by combining two locations, four frost indices, twelve phenology models and 16 climate model chains. The solid lines indicate the yearly means of the frost indices (i.e. 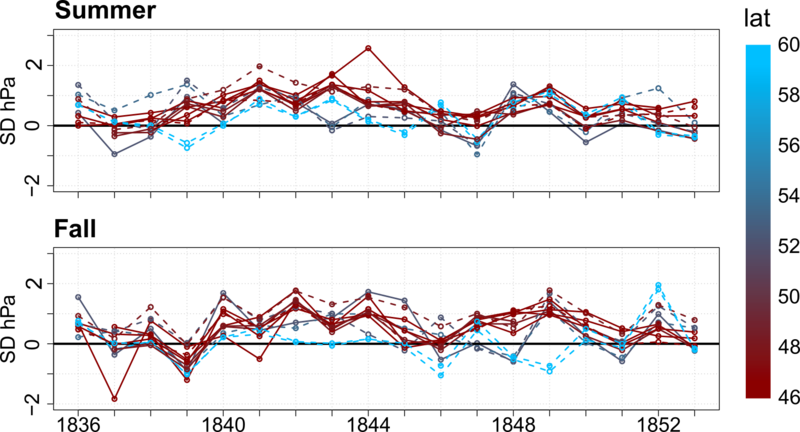 the probability of a frost day after budburst (BBCH09), p(T.n<0°C), the frequency of frost days after BBCH09, f(T.n<0°C), the temperature sum of daily minimum temperature below 0 °C after BBCH09, ∑(T.n<0°C), and the temperature sum of daily mean temperatures below 2 °C after BBCH09, ∑(T.0<2°C)), the day of year (DOY) of the last frost day and of BBCH09. The shaded areas indicate the range of +/- one standard deviation around the yearly means. 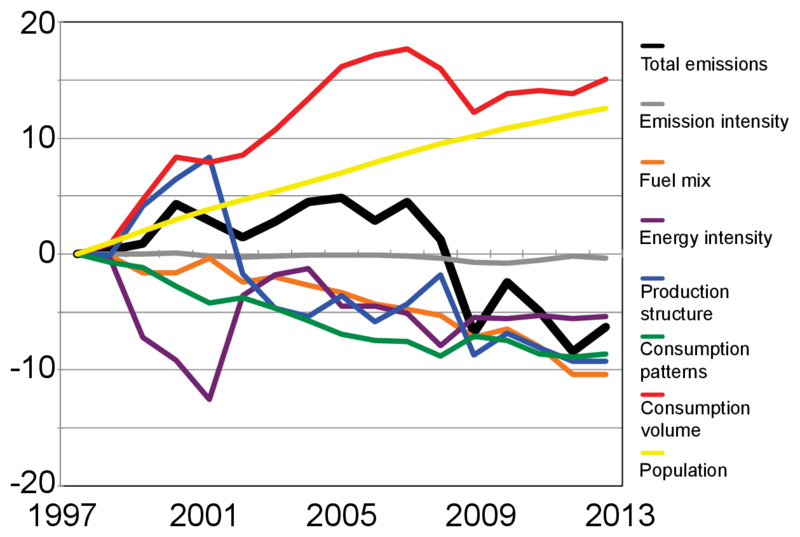 The broken red lines visualize the mean trends for the period 2001 to 2050. The average risk for spring frost damage is predicted to slightly decrease. This may support winemakers in their decisions regarding future grape varieties and frost damage prevention measures. The potential value of seasonal climate forecasts for allocating agricultural land is estimated in this thesis. Therefore, a theoretical model was developed and applied to the region of Puno in Peru. 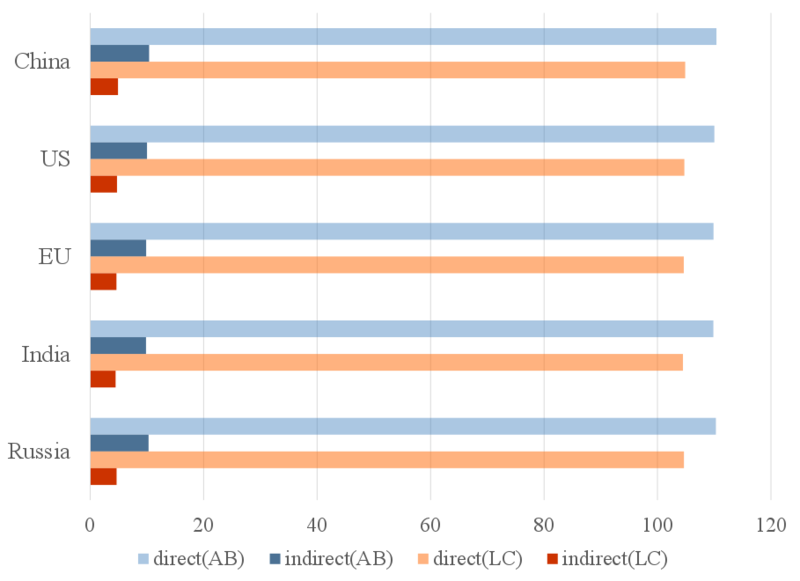 The application relies on using statistical climate data and simulated yields for quinoa and potato crops - the Figure presents yield simulations for quinoa depending on two climatic indicators, i.e. 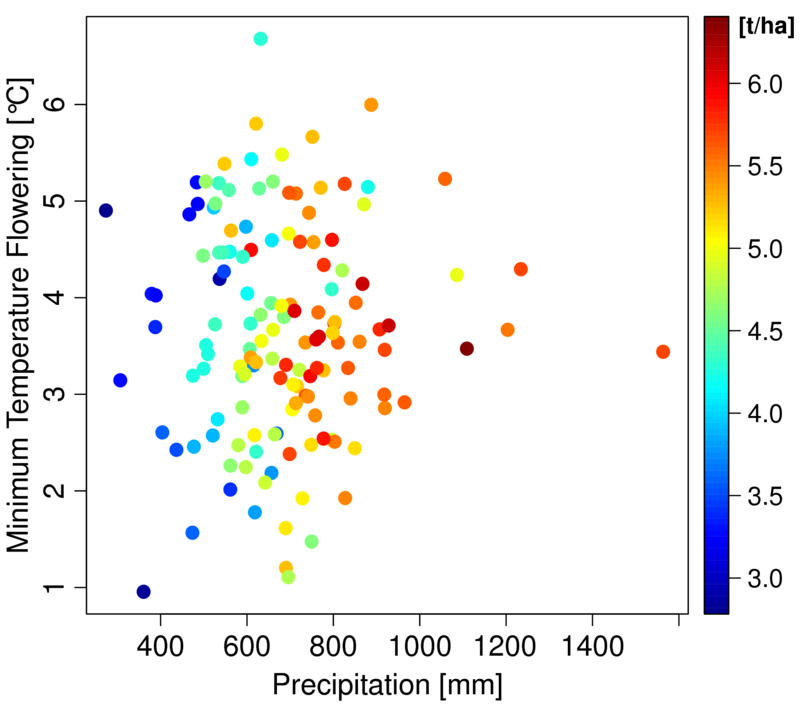 the seasonal precipitation sum and the minimum temperature during the flowering stage. The analysis shows that the expected revenue can be increased by 4.66 % when key decisions are made with seasonal forecasts, compared to a scenario without seasonal forecasts. The positive value indicates the potential of integrating high-quality seasonal forecasts into decision-making when allocating agricultural land to specific crops. The thesis assesses the influence of anthropogenic greenhouse gas emissions on temperature, precipitation and runoff of the river Thur in Switzerland. 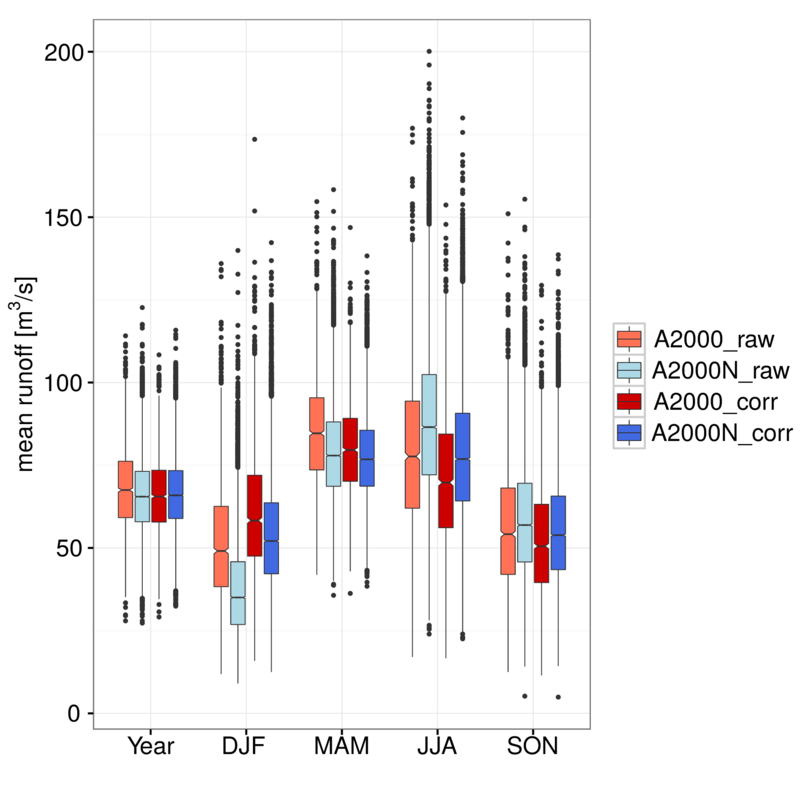 To achieve this, thousands of Global Climate Model simulations with both present-day (A2000) and pre-industrial (A2000N) climate conditions are bias-corrected (from raw to corr; see Figure) and fed into a hydrological model for the river Thur. Higher mean runoff in winter and spring is formed in the present-day scenario (red colors) compared to the pre-industrial scenario (blue colors). This is mainly caused by the combination of increased precipitation and higher temperatures in winter, resulting in less snow accumulation in the present-day scenario. Therefore, more liquid water is available in the hydrological model, leading to enhanced runoff. 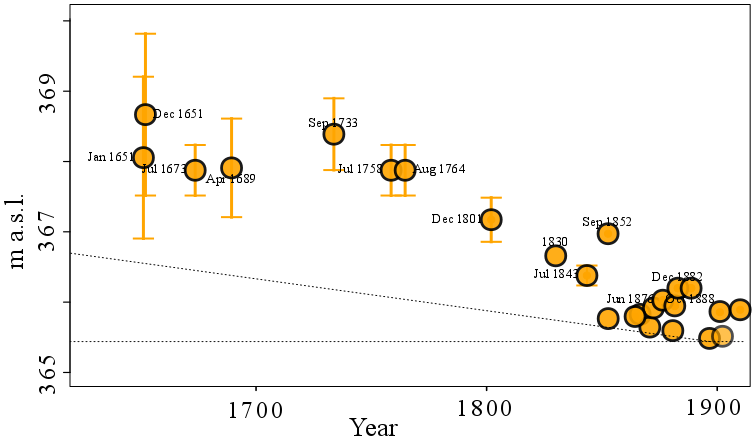 In contrast, the present-day simulations exhibit lower runoff in summer and autumn than the pre-industrial simulations. This may be caused by the higher temperatures in the present-day scenario which enhance evapotranspiration and thus decrease the amount of water entering the hydrological model. These findings may support decision-makers in climate-related risk and adaptation management. Weak points along the main rivers of the Bernese Oberland (Switzerland). Weak points are locations along a river bed where the channel capacity is frequently exceeded during periods of high river discharges. Hence, weak points indicate potential focii for flood protection measures. Technically, weak points are defined as cross sections of the river bed where the bank-full discharge (channel capacity) has a flood recurrence period (HQ) between 30 and 100 years (red to yellow lines). Whereas specific river sections had been analyzed in practice so far, entire watersheds of the Bernese Oberland (Switzerland) were investigated in this thesis. The highest numbers of weak points (relative to the number of measured cross sections) are found for the Simme, Weisse Lütschine and the Hasli-Aare rivers. The good news is that frequently exceeded channel capacities (<= HQ30) are located along unpopulated areas. However, the protection aim of HQ100 along populated areas is not hold along parts of the Weisse Lütschine and the Simme, and neither along the Aare within the cities of Thun and Bern. These findings provide valuable information for both national and regional watershed administration. Seasonal total precipitation near Mt. Kenya, interpolated from gauge measurements during the Long Rains (March-April-May) in 1977. The seasonal precipitation pattern in Central Kenya is highly influenced by the peculiar topography of the area, especially by Mt. Kenya (contour lines; bottom right quadrant). In this thesis, interpolations for seasonal and annual totals are obtained from rain gauge measurements (filled squares) using a combined approach of multiple linear regression with topographic predictors and ordinary kriging of residual precipitation. For the boreal spring rainy season, highest amounts of precipitation are found for the south-eastern slopes of the mountain. Recent changes in agricultural practices and population growth have triggered conflicts between different water users, as economy and food security highly depend on rain-fed agriculture and river water discharge. 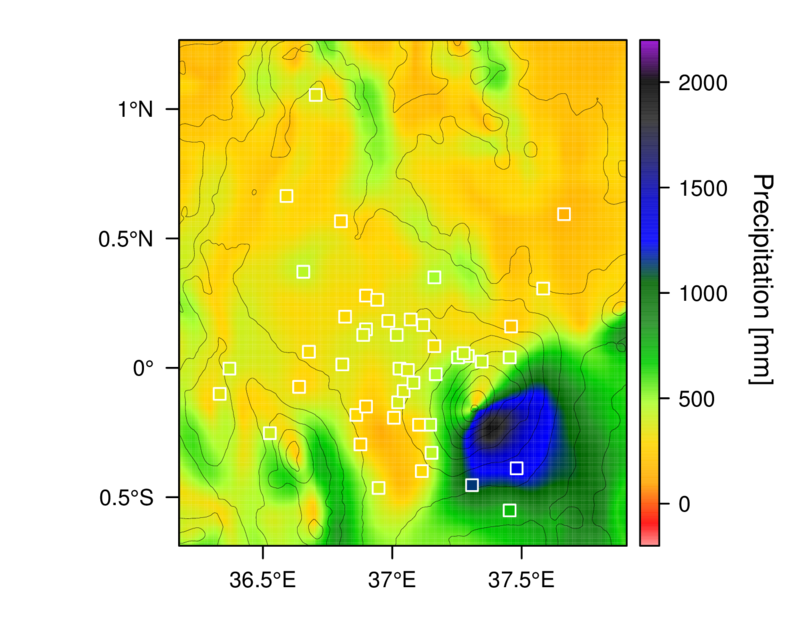 In this context, the provided spatial information about rainfall can be used for water ressource allocations, for hydrological studies or to monitor trends over space and time. Cumulative influences of various drivers on the total CO2 emissions in the US from 1997 to 2013. During the economic recession, between 2007 and 2009, the CO2 emissions dropped by approximately 10%, where the production structure as well as the consumption volume played the most important roles in said decline. The influence of the fuel mix was more or less continuously negative over the entire time period and sums up to the strongest negative influence on the CO2 emissions from 1997 to 2013. The fuel mix describes changes in energy use from coal to gas, from coal to renewables, from oil products to renewables, etc.